I supposed being known as Land of the Free will allow her. Many will support her. She has the balance of East n West. 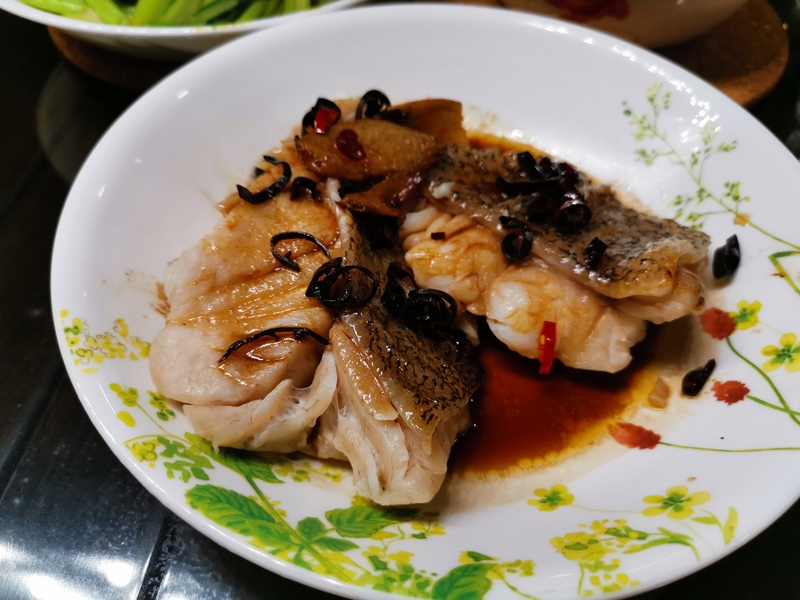 Your photo of snowfish, looks like Chilean seabass. Chilean sea bass is about Cdn$50 a pound in Toronto. If and when I buy it, I steamed it with Chinese mushrooms, scallions and some ginger and soy sauce. A colleague brought me to a countryside restaurant for lunch this afternoon, its simple. 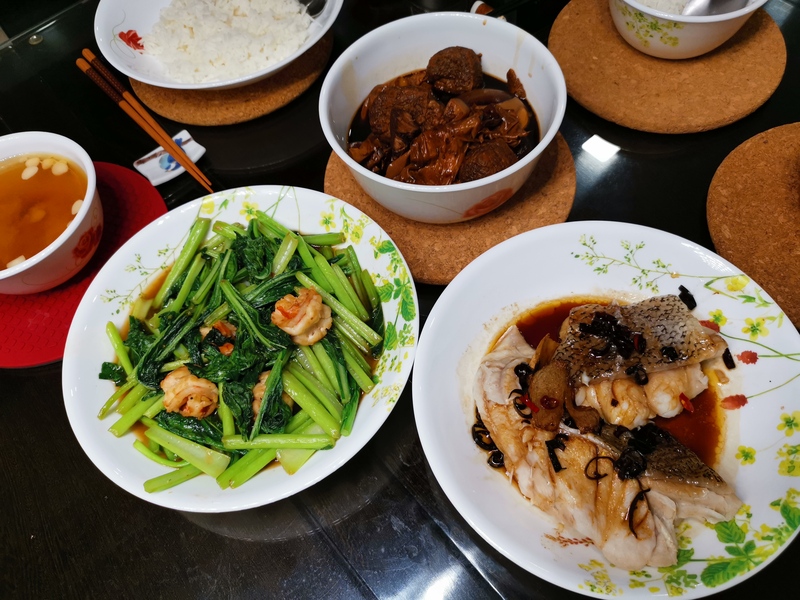 Food is old style and very tasty. Started with some blue flower drink which is very refreshing. Its always nice when someone cooks a dinner for you, even though its a simple meal. Visited a friend today. 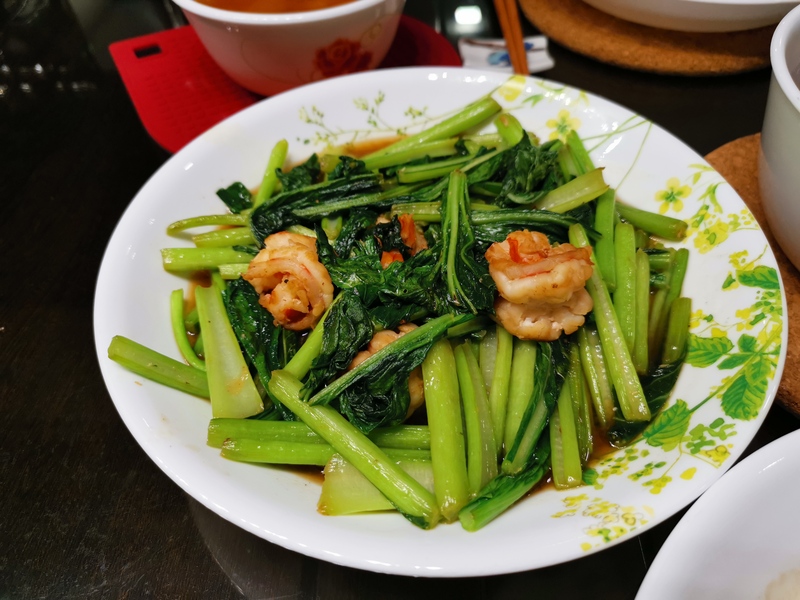 For home-cooked meal, this Krapow moo kai dow is of high standard. Can fight most thai food stalls in Singapore. 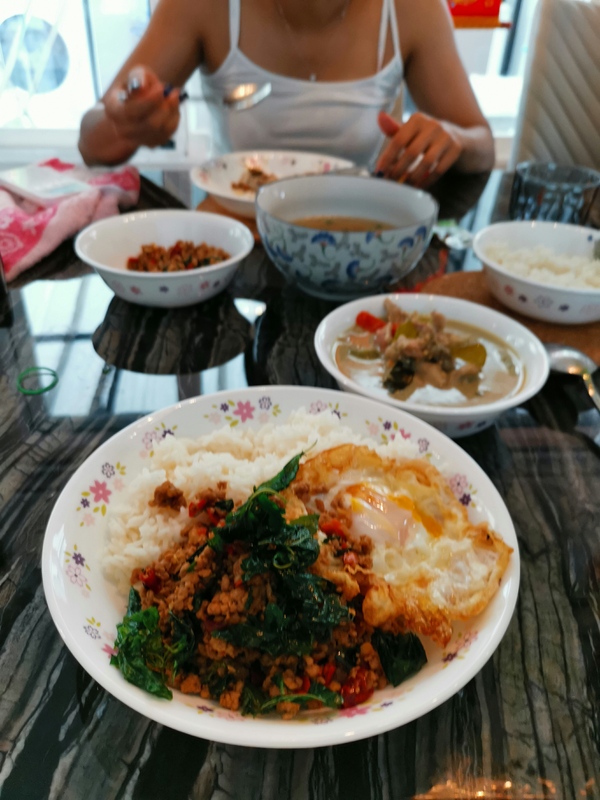 This friend can cook pretty well simple Thai food. That's it, Chilean sea bass. Smog returned to most parts of the Greater Bangkok on Wednesday afternoon. After about 10 days of respite, the amount of PM2.5 or particulates of 2.5 micron in diameter or less started soaring past safe limits again in the capital and its adjacent provinces. Out of 43 areas where air-quality monitoring devices are available, 28 found the PM2.5 amount went past the safe limit at 3pm on Wednesday. The World Health Organisation has described PM2.5 as carcinogenic. According to Thailand’s Pollution Control Department, the amount of PM2.5 should not go beyond 50 micrograms per cubic metre of air. In Bangkok’s Charoenkrung-Bang Kho Laem area, the amount of PM2.5 stood at 46 as of 9am on Wednesday. The amount then soared to 58 by noon and 64 by 3pm. Air pollution looks set to continue in the Greater Bangkok on Thursday. 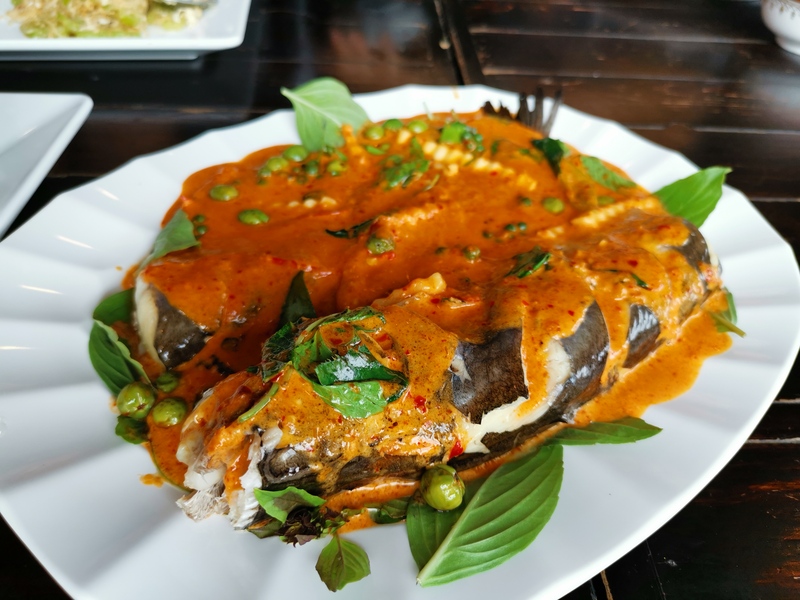 Lao Dtom Lao, which is loosely translated as "Laos people cooking Laos food" is the newest venture of Chakkrapatipong restaurateur-chef Joke Pairomahakij. Operating out of the same space that used to house the now-closed Hazel's ice cream parlour and fine drinks, the shophouse has undergone a complete makeover and bears zero resemblance to Hazel's. 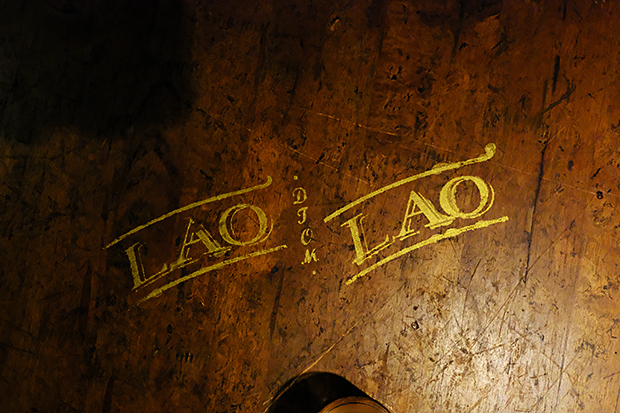 With four tables, its cosy interior puts traditional Laotian fare in the spotlight, coupled with traditional music. As the story goes, head chef Dayvith "Daeng" Chanthavongsa is Laotian and used to have a small stall, which chef Joke frequented often. When he decided to shut shop, the two got into business and LDL was born. 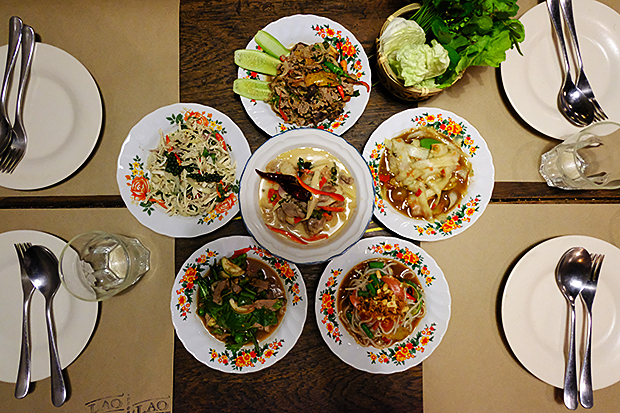 The menu is conceived by chef Daeng, who wants to bring "proper Laotian food to Thailand. 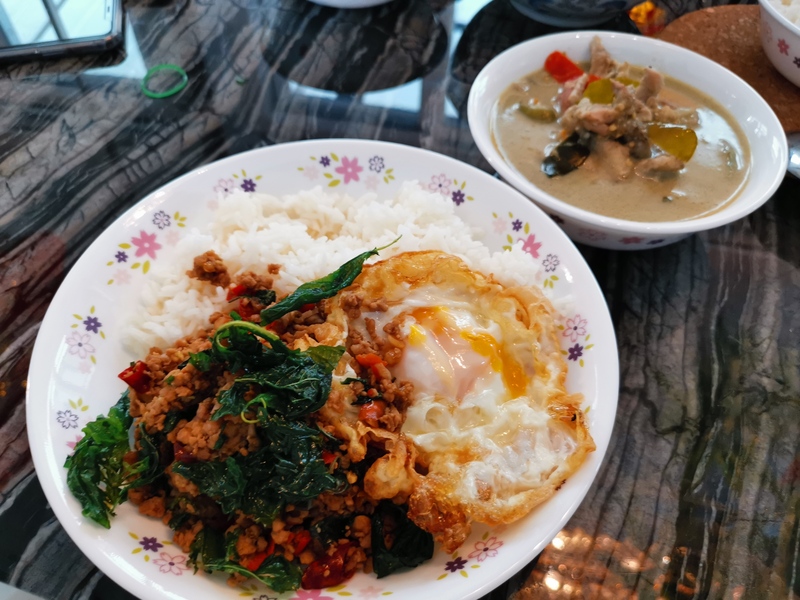 This is the food I ate while growing up and it is different to Northeastern Thai food. 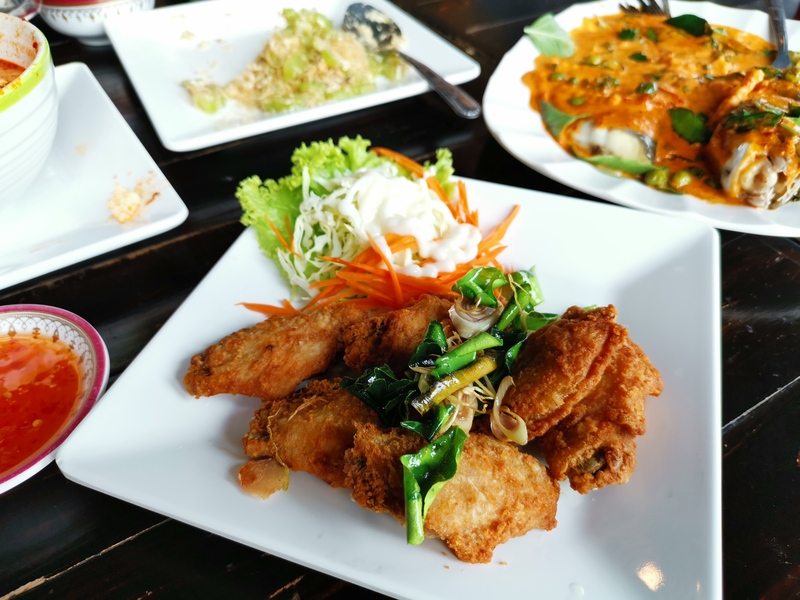 There are a few ingredients that make the cuisines differ from each other. 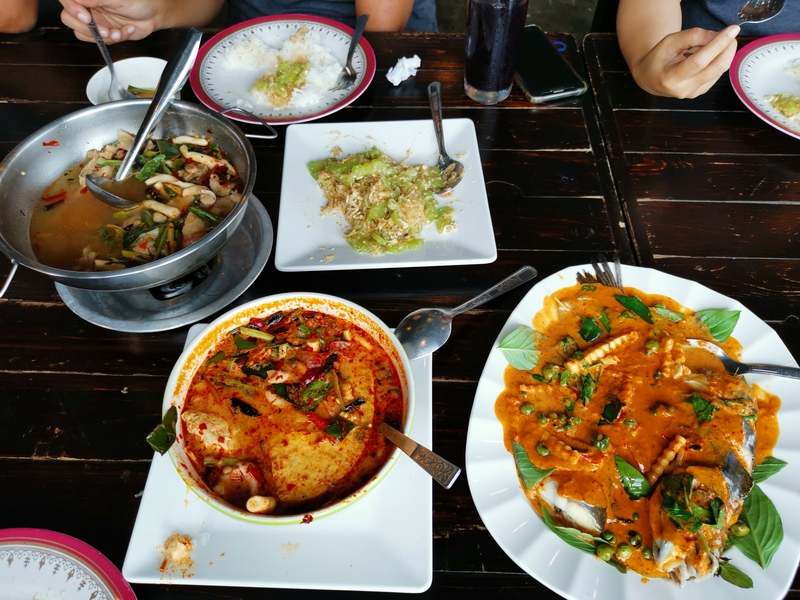 "Isan food has khao kua, which is toasted rice powder made from toasting the rice in a pan. In Laos, we have khao buea, which is rice soaked in water to ferment it. It is dried and then toasted," says the chef, giving an example of the difference in the two cuisines. 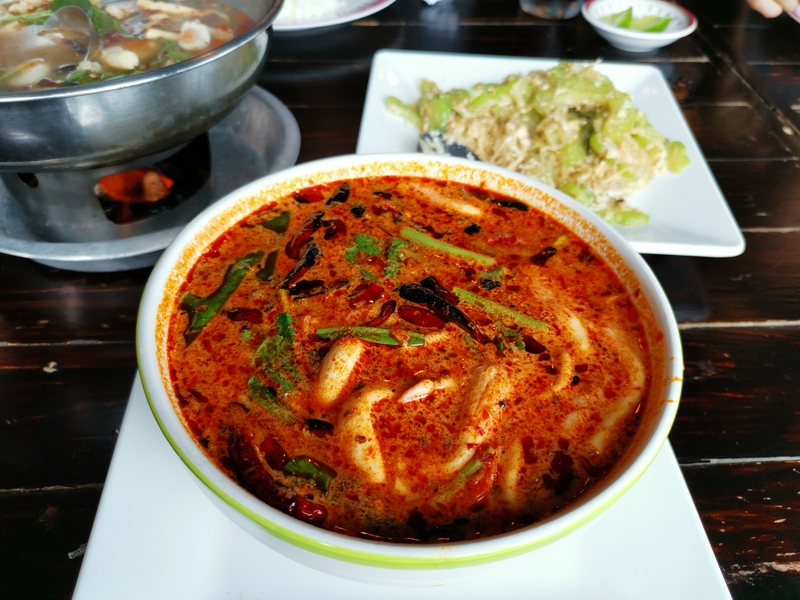 To make it easy for customers, the menu is broken into Spicy salads, Curry soup, Clear spicy soup, Veggies and dips, Chargrilled and fried, Spicy salad with roasted rice, One dish meals and Dessert. As is done in this part of the world, place an order for a bunch of things and enjoy them all together -- a little bit of this and a little bit of that. I order the Grilled beef (B140) and Grilled pork sausages (B120). 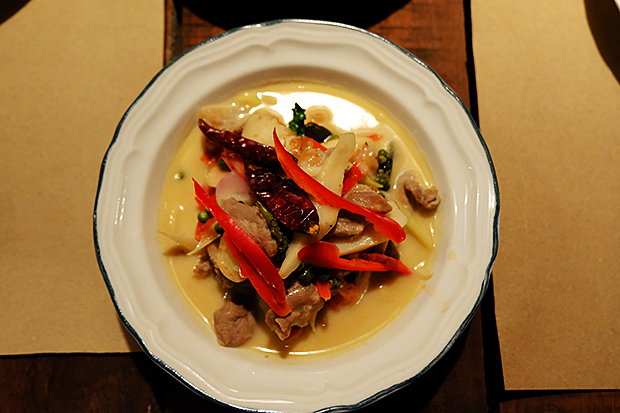 Chef Daeng makes the sausages himself, from scratch, and has perfected the recipe over the years. The beef and pork are marinated in the crying tiger or sua rong hai-style and then turned into sausages. 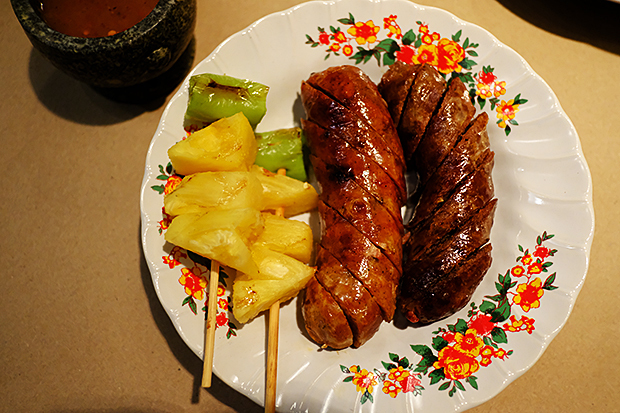 Served with skewers of roasted pineapple and burnt green chilli, the crying tiger sausages are a tasty delight and go well with nam jim jaew-Laos style. The sauce is made with tamarind, chilli, palm sugar and a low quality fish sauce mixed with water, so the aroma isn't pungent. I have never had the Fresh pepper chicken with spicy dressing salad (B90) anywhere else and it is quite unique to LDL. Shredded chicken is mixed with black and green peppers, onions and beetle nut leaves. 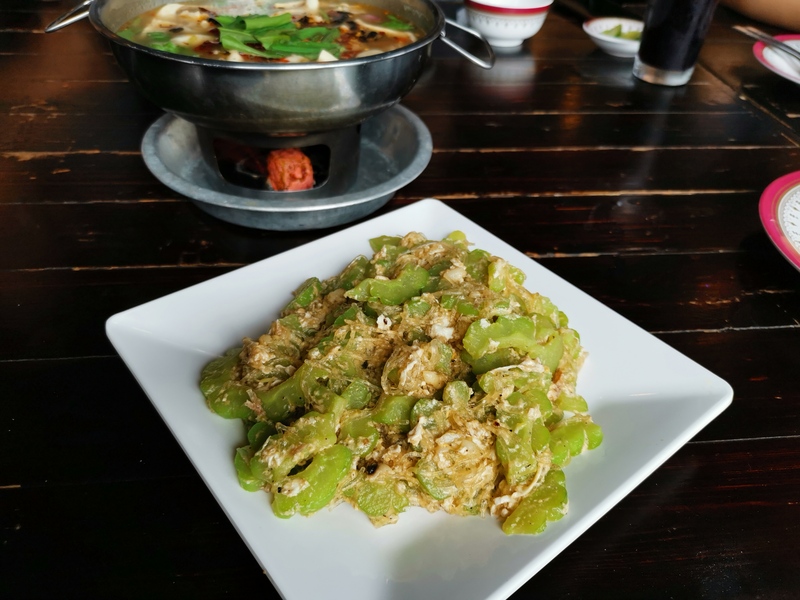 Served with fresh chilli slices and sprigs of green peppers, it stands out from the others. No matter how I may despise duck face, I am a sucker for Fried duck beak (B140), so naturally when I see it on a menu, I order it. A tad disappointing, as I have had better elsewhere. Since this is a rather dry dish, I washed it down with LDL's signature cocktail curated by Seven Spoons' talented bartender and LDL's co-owner Joey Keen. The Garden (B250), a heady mix of Isan rum, peach honey syrup, grapefruit bitters and Thai basil wets the mouth rather nicely. 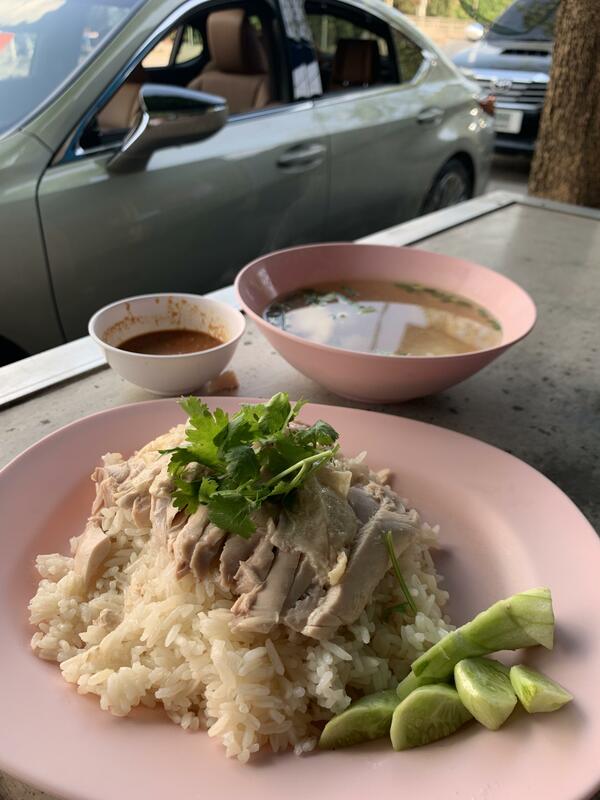 If you're in a rush or are a solo dinner and need one spectacular dish, order the Rice noodles with duck curry (B160) or locally known as khanom jeen nam ya phed. This is one of those dishes you first eat with your eyes and then your palate. It has barely made its way to the table and I am salivating in anticipation. Served with sugar, a wedge of lime, dried red chillies and fresh vegetables, for those of you who can't handle the heat. Though not a fan of nam ya, I enjoyed this dish immensely. 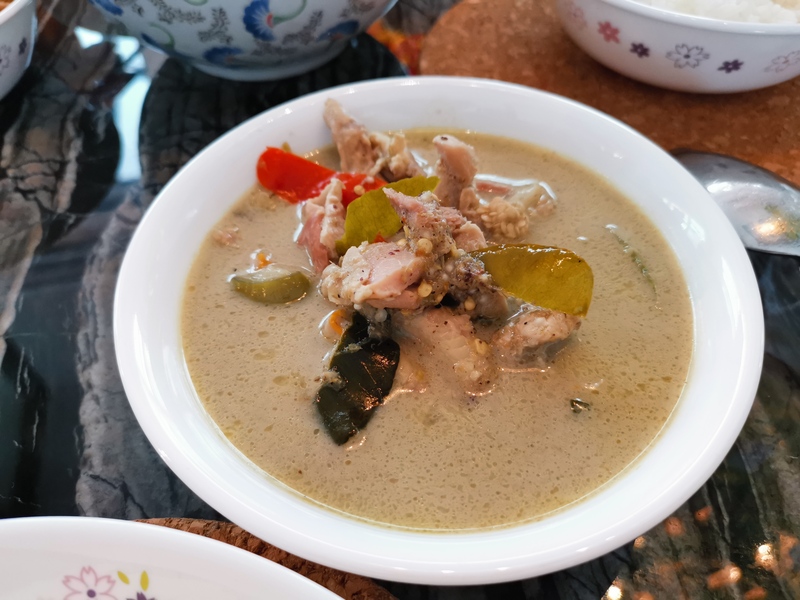 A must-try is the Duck coconut soup (B160), which may look like a tom kha gai, but with duck. However, the duck brings an interesting flavour to the soup. I am not a major fan of coconut milk, but this, honey, this I could eat the entire bowl by myself. The Papaya salad with dried fish (B110) is an acquired taste. 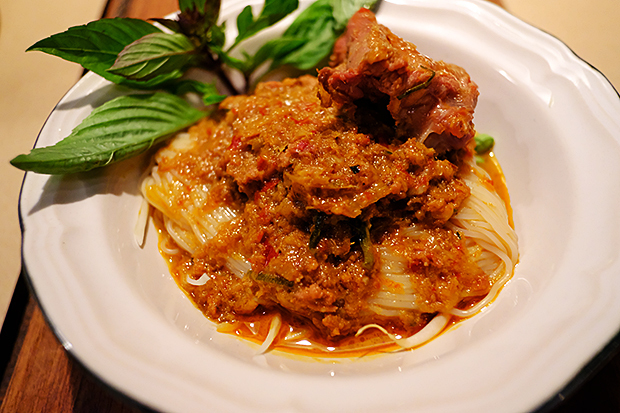 The papaya resembles thick flat pasta rather than the shredded variety that is popular in Thailand. Also I noticed that makok or Laos olives are added, which gives it a different taste compared to the normal som tam you get at street stalls. If this is a tad spicy for you, try the Spicy cooler (B250) a mix of Mekhong rum, ginger, kaffir lime leaves, Angostura bitters and lime. I am saving the best for the last and it is the Yum khao piak or Laos noodles salad with dried fish (B90). 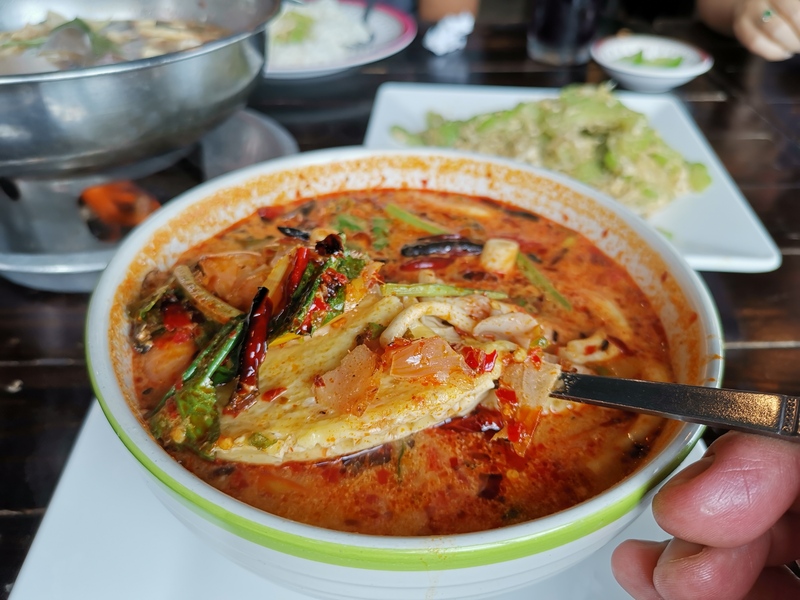 The noodles are imported from Laos and are thinner than Vietnamese noodles but thicker and stickier than the Thai khanom jeen. The noodles are mixed with fried onions, peanuts, a hint of pla ra and makok and will have you wanting more. 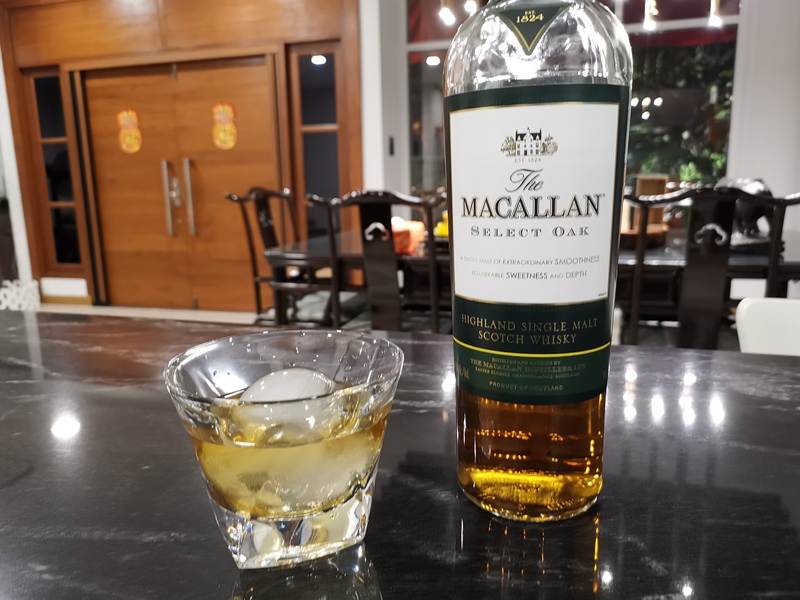 Since there is only one dessert as of now, it is best to give it a shot. Who can go wrong with Steamed sweetcorn wrapped in corn leaf (B90)? Khao dome sa lee is sliced corn, mixed with sticky rice, tapioca pearls or sago, coconut milk and sugar. It is then put into the corn leaves and steamed until set. 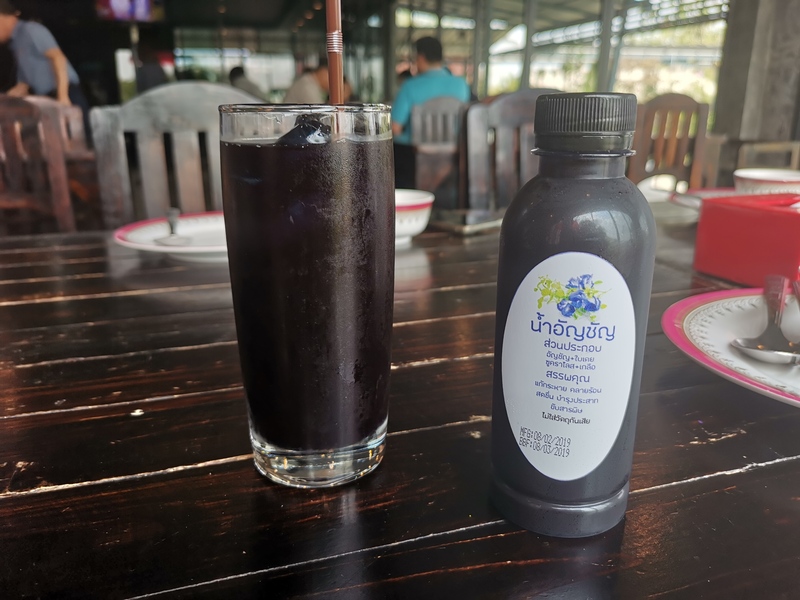 It wouldn't be a Laotian restaurant if no Beer Laos dark (B120) was served, and it is on the menu along with the usual suspects -- Fresh sugarcane and rosella juices (B60). Full disclosure: It is common knowledge that I used to be chef Joke's business partner at Seven Spoons, having exited the partnership in January 2017. This is an unbiased review. When chef Dayvith was about to shut his original restaurant, chef Joke ordered a bunch of different dishes and froze them to enjoy later. If this isn't indication enough that you need to get to Bangkok's Old Town now, I don't know what is. So worth the trek, much like Seven Spoons. PEOPLE MUST brace for extreme heat in the days to come, as an extraordinarily hot and arid summer has been forecast for Thailand from Thursday, while seven provinces in the North and the West are expected to experience extreme heat at 40-44 degrees Celsius. Due to the forecast for scorching heat in Thailand this summer, the Disease Control Department’s Occupational and Environmental Diseases Bureau director, Dr Chantana Padungtod, has urged people to be more cautious about exposure to the heat for too long and to keep hydrated so as to avoid a heat stroke. “Outdoor labourers are among the groups facing the greatest risk of heat-related sicknesses, as many of them, such as construction workers or conscripts, have to undertake hard physical labour for long hours under the hot sun. Employers should consider the health and well-being of their workers by shortening their working hours during hot days,” Chantana suggested. “The elderly are also vulnerable to being affected by the heat wave, especially those who live alone in condos, because most high-rise residences lack air flow and can be dangerously hot during daytime. Family members or their guardians should not leave the seniors alone,” she suggested. She also urged people to always eat clean food and maintain a hygienic way of life in order to prevent diarrhoea and other illnesses, which are common infectious diseases during the summer. Meteorological Department director-general Phuwieng Prakhammintara told a press conference in Pattaya on Saturday that summer will officially begin in Thailand on February 21, and the climate in every part of the country would become very hot and arid during the following months until the rainy season arrives in May. Phuwieng warned that people in the upper part of Thailand would have to endure unusually hot weather in March and April this year, as the temperature could soar to over 40 degrees Celsius for several days, which would be hotter than last year’s around 1-2 degrees Celsius. He further noted that Mae Hong Son, Lampang, Uttaradit, Sukhothai, Tak, Nakhon Sawan, and Kanchanaburi will face extreme heat up to 44 degrees Celsius during the height of summer. However, he said it was unlikely that the temperature this year would break Thailand’s all-time record of 44.6 degrees Celsius, measured at Mae Hong Son on April 28, 2016. Earlier this month, the Meteorological Department’s Climatological Centre forecast that the average maximum temperature this summer in the upper part of the country could reach 35 to 37 degrees Celsius, which would be higher than both the long-term mean temperature during this time of the year of 35.3 degrees and the previous year’s 34.2 degrees Celsius. “While we expect temperature levels higher than usual in every part of the country this year, people should be cautious about water shortages too, as precipitation during this summer is also expected to be lower than average, so we should use water wisely during the summer months,” Phuwieng said. He also cautioned people to beware of the danger to lives and property from intense summer storms, wild fires and tropical cyclones in the Andaman Sea. 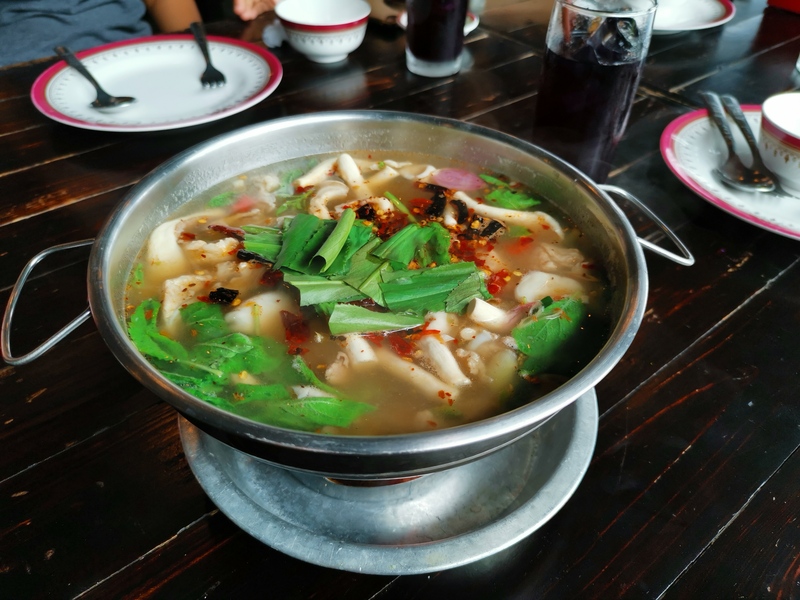 According to the temperature record during this winter, it was found that the country was warmer than average, especially in the Central Region and the Bangkok metropolitan area, which experienced only a few cold days. The temperature record with the Meteorological Department during last December shows that Bangkok experienced 22 days of very hot weather of 32 degrees Celsius, which is even higher than this month’s maximum temperature mean. There were 11 days in January when the days were extraordinarily hotter than average. climate on the western part of the Pacific. Climate change was also responsible for extreme weather patterns this summer, according to an academic observation about global warming trends in 2018. Berkeley Earth, a California-based non-profit research organisation, disclosed that Thailand’s annual temperature mean increased by 0.7 degrees Celsius compared to the mean temperature of the 19th century. On the global level, US space agency Nasa and the National Oceanic and Atmospheric Administration (NOAA) announced earlier this month that 2018 was the fourth warmest year since 1880. According to scientists at Nasa’s Goddard Institute for Space Studies (GISS) in New York, the earth’s surface mean temperature in 2018 was 0.83 degrees Celsius warmer than the 1951-to-1980 mean. GISS director Gavin Schmidt said that the global temperature in 2018 ranks only behind those of 2016, 2017 and 2015, so the past five years were, collectively, the warmest years in modern records. Schmidt stressed that the worrisome warming had been driven in large part by increased emissions into the atmosphere of carbon dioxide and other greenhouse gases caused by human activities. “The impacts of long-term global warming are already being felt – in coastal flooding, heat waves, intense precipitation and ecosystem change,” he warned. The NOAA also revealed that it had detected the highest-ever atmospheric carbon concentration level of 414.27 parts per million at the Mauna Loa Observatory last Monday. The global temperature is expected to further rise this year and could eventually make 2019 the second hottest year ever, climate change analysis by Berkeley Earth predicted. “At present it appears that there is roughly a 50 per cent likelihood that 2019 will become the second warmest year since 1850,” the analysis noted.